I didn't know biscotti were baked twice even though I've purchased my fair share of biscotti to go along with a cappuccino or latte over the years. Now, I can stroke biscotti off my list of things to try making at home, and I may never buy one again. 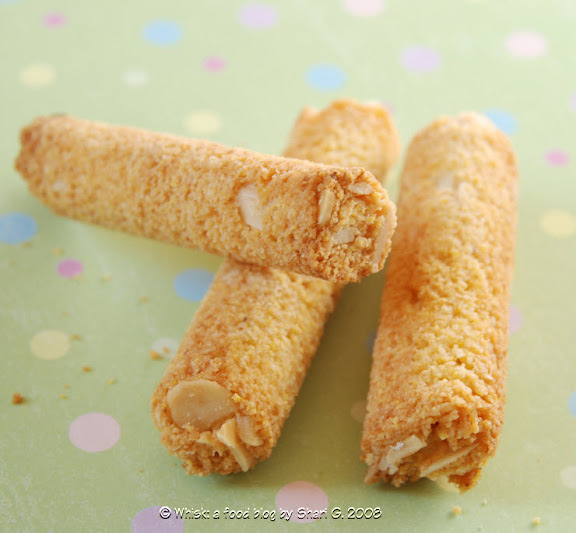 Traditionally, biscotti are almond flavored, and this version has both almond extract and sliced almonds in it. Tony Fortuna of the Lenox Restaurant gave this authentic recipe for biscotti to Dorie, and I'm thankful for that! Dorie also named it one of her top ten favorite recipes from this cookbook we're baking through. Because they have a hard texture, they are best dipped in coffee or tea (or better yet a latte), then they absorb the flavor of your preferred morning pick-me-up and melt in your mouth, and before you know it you're digging into your Tupperware container for another hit of biscotti, repeating this motion until you run out of one or both. I wanted to play around with the shape of biscotti. I pulled out my trusty coin wrappers again as I did for the Chunky Peanut Butter and Oatmeal Chocolate Chipsters. This time, with the urging of a friend living in the United States who can't get twoonie or loonie coin wrappers like we have in Canada, I wanted to try making them in the smaller penny, dime, and nickel versions to show that it's possible. Of course, stuffing biscotti batter into the coin wrappers is time consuming, but it's worth it because they make the best dunkers! As well, after the first baking, some of the batter spilled out. But it's easy to trim these parts off. Then, I carefully unpeeled the coin wrapper and baked them for the second time until they were golden. Here's a great step-by-step article showing how to form traditional biscotti. You can find the recipe for Lenox Almond Biscotti in the book Baking: From My Home to Yours by Dorie Greenspan or here or here. To see how the rest of the TWD group fared with this week's recipe, click here and then click on each blogger! Thanks to Gretchen from Canela & Comino who chose the recipe for this week. I'm almost out of biscotti and will have to make this batch again soon. 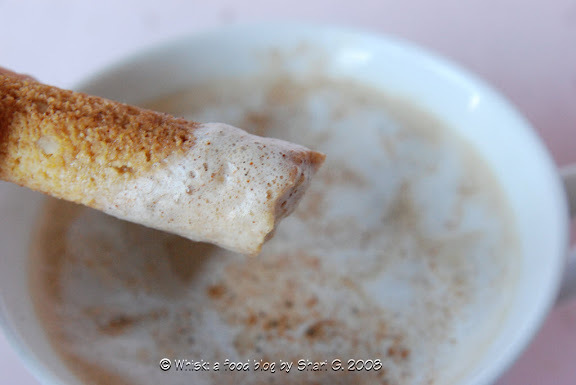 Mornings just won't be the same without a little biscotti dunked into my latte. I'm looking forward to playing around with the flavorings next time too. Pumpkin Muffins on page 13 chosen by Kelly from Sounding My Barbaric Gulp. I'm giving away a free 1-year subscription to Bon Appétit magazine. To enter to win, all you need to do is comment on this blog post. On Monday, October 20, I’ll randomly select a winner from all the comments that have been submitted on this post. I will email the winner and post their name in next week's TWD post. Have a great week! I love your round biscotti! The shape is very nice, the colour beautiful and they look extremely tasty!! I can see why you are already almost out of biscotti! Shari, these are the coolest biscotti I have ever seen. You've got to go commercial with them! marthe - They were the best biscotti I've ever tasted. Dipped in chocolate would be even better, I think! meeta - Thanks for your vote of confidence! If they weren't so difficult to get into a coin wrapper, it might be a consideration!! You had me at the first picture of your round biscotti, what a great idea. Then I saw them dipped in the coffee and it became a need! Lovely! Those are so fun! I love how you play with your food to such great results. zoe - After your comment, I went to make another latte just to have another biscotti. Now I only have 2 left! It's all your fault! Thanks for all the fun your share. PS I love the biscotti too! I really love the non-traditional shape. That photo of the dunked cookie...scrumptious! As usual Shari... you're the one to look up to! love your blog! the absolute best.... thanks! Shari- your biscotti is absolutely beautiful! I love the shape and the creativity you add to every recipe. Thanks for the link about Dorie's favorites- that was a nice read! I am intrigued by your round biscotti! I would have never thought of stuffing batter into a coin wrapper! They turned out beautifully! Those are so awesome. And I agree, dunking in coffee is really the way to go. Wow! That's quite a bit of effort. They look beautiful. Those are amazingly beautiful! I've honestly never seen biscotti so pretty! You are always so creative. Weren't the biscotti's so good! I absolutely love your presentation and your biscotti are fabulous.I love the round. 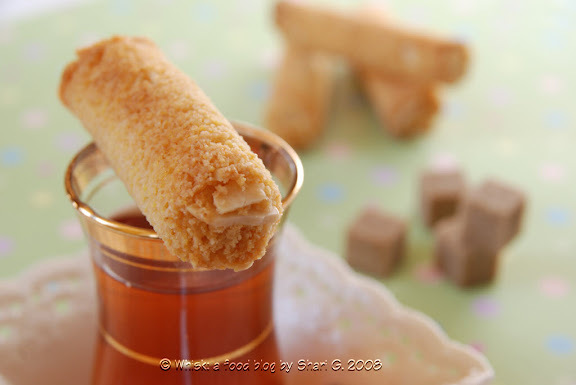 That shape looks perfect for dunking - I really need to try that shaping method out. I am amazed by your photos! Such creativity. I thought TWD was a baking club, but I have found that i have learned a lot about photography since being a member too! I have a lot to learn yet. Great job and beautiful biscotti. LOVE the round ones! Oh wow, Love the Round Biscotti! What a great idea! Your blog is delightful to read! It makes me hungry looking at it. I love how you do the step-by-step recipe approach! And you have beautiful pictures too! Always creating the most fun things on Tuesdays! Thanks for being an inspiration! Brilliant idea, using those coin wrappers! As usual, a lovely post! How cool that you made them round. I wouldn't have the patience to fill the rappers. Didn't it stick to everything? these are so adorable in coin-wrapper form ;) awesome pics! glad you liked the recipe! Love the variation! These look delicious! Wow they look wonderful. you are always so inventive. Very nice photos. I love looking at your blog! WOW. I came here from foodgawker, being drawn by the picture. Not to mention that I initially thought that "coin wrapper" was some exotic type of dough that I'd never heard of (you know, like won ton wrapper or something). I really loved what you did with something so basic. Very cool. what a pretty presentation! These were so good. Coin Wrappers! Paper Coin Wrappers to bake you biscotti and cookies in! That is toooooooo clever. Thank you for your very enjoyable blog and thank you for the coin wrapper idea. I love it and will definitely try it. These are fabulous! What a creative idea! They look both beautiful and delicious! WOnderful! I really love the look of your biscotti. Your biscotti makes me wish I liked biscotti! Brilliant! I'm going to borrow that technique. cool shape! what a great idea! Coin wrappers - That's a great idea! Holy Smokes! You are just too creative for words! I love the coin wrappers. Now you can say, I like the penny size. Beautiful take on this recipe. I love the idea of the round biscotti shape...you are so very clever, as always. Great photography. This is a "one-stop shopping" blog...it's all here each week! You are so creative! I love it. And I am lusting after your glassware, so pretty. I absolutely love the way you shaped these, Shari. Genius and pretty! Coin wrappers?! What a fantastic idea for optimal dipping!!! Gorgeous pictures! Very inventive! I love the shape, I think they are much prettier than the traditional way and it seems they would be better for dunking! I love how these look. They are so classya nd inviting. I love your pics, the glasses and your new header. This blog is beautiful! prudy - I love playing with food! amyruth - Sure thing. I could send you a twoonie/loonie version, but they work fine with the penny version too. Just email me your address! linda - Dunking them was so delicious and fun! lori - I'll have to give piping a try. There has to be an easier way! vibi - Your comments make me smile! jan - You're too kind! anne - I enjoyed reading her top ten too and can't wait to try more of them. karen - It was fun to try something different with this batter. rainbowbrown - Coffee and biscotti sure go well together! jules someone - It's worth the effort now and then. katie barlow - They were delicious! I can't wait to try different flavors. engineer baker - The ends that you trim off bake well too. lady - Thanks for dropping by! gretchen noelle - You're an inspiration, blogging from Peru! madam chow - Thanks for taking time to leave a comment! chocolatechic - It was messy, but that's kinda fun too. mary - I have been happy eating them up! katie - Thanks for stopping by! natalie - You're so sweet! c - I like your take on coin wrapper and how you thought of it at first! y - They are better than cigars! audrey - They were delicious! linda vandewark stoodley - Definitely give it a go! stickygooeycreamychewy - They were delicious and behaved themselves pretty well in the wrapper! sara - Thanks for dropping by! stephanie - Too bad you don't like them, but you could try this technique with a different cookie batter. karen - It's kinda child-like to dunk something into your drink, but delicious! dana mccauley - Give it a try! the food librarian - It's so much easier to use the larger versions, though! kayte - You're too sweet! natashya - We got those glasses in Turkey a long time ago, but they were a good purchase! melissa - They work great for dipping! lynda - They're easy to make and delicious. I like the idea of adding chocolate to them! mary ann - They are definitely better for dunking this way! Thanks everyone for dropping by! Saw these through Tastespotting and loved the creativity that you used for the shape! I love your perfectly round biscotti! I loved these too. They're so good and easy to make. I don't think I'll ever buy one again either. i love the shape--what a great idea! do you get your wrappers from the bank? they must think you have a giant coin collection! that is so creative, great pictures! Another fabulous idea, Shari! These look wonderful, all rounded out and eager to be eaten. Beautiful job! Round biscotti...I never would have thought of this, but they are so gorgeous! I really have to try baking cookies this way, that shape is so cute! I just can't get over how beautifully your biscotti came out - Brilliant idea to use coin wrappers. I'm thinking of trying that now too. I've got to try your "coin trick." And thanks for the Dorie link! I had no idea this recipe was one of her favorites. Cool. wow i love the shape of your biscotti, how creative! 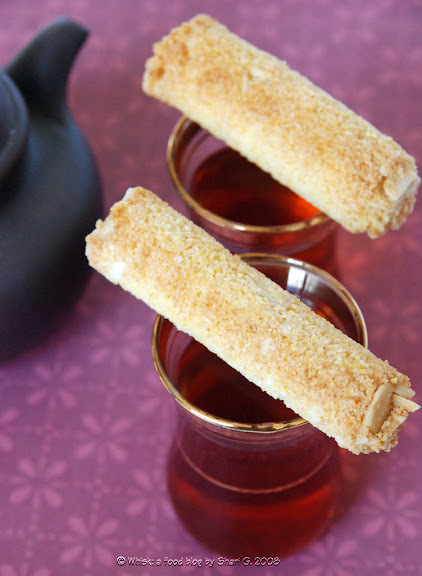 Round biscotti is a great idea! I love it! Great idea to make them in coin wrappers! Did you think about using a piping bag with a large round tip (or a ziplock with the corner cut off) to fill the wrappers? If you aren't using large chunks of add ins, it might be easier than trying to cram the dough in. I loved this recipe. It was soooo good and easy. I love your coin-wrapper biscotti. Did you use a pastry bag to get the dougn in there? Your pictures are gorgeous. Yum! How fun! A give away combined with a great post. The coin wrappers are a new one on me, but they make beautiful cookies! Your biscotti look delicious. Oh my word! The round coin wrapper biscotti are the neatest things ever! I bet that was a lot of work, but they sure look beautiful! 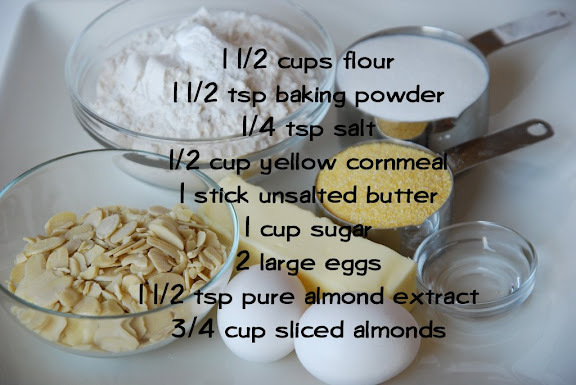 I had not realized that this recipe is one of Dorie's top 10 -- it is certainly one of my favorites so far. So glad that you enjoyed them too! I love how TWD forces us to make things we might not otherwise choose on our own. Thanks for visiting my blog! I love the shape of your biscotti! I am so going to have to try this! Thanks for the tip! elizabeth - I'm glad you came for a visit! annette - They are so good homemade! steph-whisk/spoon - I wish I had a bigger coin collection! Actually, I can get the coin wrappers at a dollar store here. mary jo - Thanks for dropping by! hungry crasian - The only hard part is getting the batter in, but fingers work. pamela - We've eagerly eaten them all up! ari (baking and books) - These would be perfect for a tea party. rebecca - It was interesting to see her favorites, and I'm looking forward to the others. amy - Thanks for leaving a comment! leslie - I'll have to try a piping bag next time. It might be easier! pinkstripes - I used my fingers, but I'll have to try a piping bag next time. cathy - It's my favorite so far! Although the Quintuple brownies are a close second. Thanks everyone for stopping by. I'm overwhelmed! What a unique way to shape biscotti! I have always loved the look of sliced biscotti, I think because I have never known anything but sliced biscotti. Round! And formed in coin wrappers! I love the creativity in this TWD group. In the last week, the value of our dollar's turned pretty "Loonie," as well! Love your off-beat use of coin wrappers! Ciao Shari ! I love your idea if the coin wrapper ! They are the best looking biscotti so far ! Thank you for visiting ! I loved your pumpkin pies as well and havin a pumpkin and a daughter (she is not yet five and I fear every egg she breaks, but this is the way to learn I think) waiting I might steal your chai idea ! Neat idea to use the coin wrappers for these. They look great! I too love the shape of the biscotti. I do not believe I've seen that before. Major kudos to you, Miss! I love biscotti, but I have the same problem with it that I have with Captain Crunch -- the roof of my mouth always hurts afterward! Hi Shari! I just found your blog from your fellow TWD poster She's Becoming DoughMessTic. Wow! You are really talented! I just wanted to let your American fans know that they can go to any bank and ask for either quarter rolls or $1 coin rolls (the are about the same diameter) and they should get them for free :) I don't think they are as big as Twoonies but the should be close to Loonies. Cheers!